(It's also the root of poner in Spanish-- and many of these words will be cognates-- easy to learn if you speak Spanish.) The 'pos' form comes from the past participle of ponere. The list gives each word, its part of speech (n= noun, v= verb, adj= adjective), and a simple definition of the most common meaning(s). Consult an English dictionary for complete definitions and all the meanings of each word. At the bottom of the page are some fill-ins to practice these words. 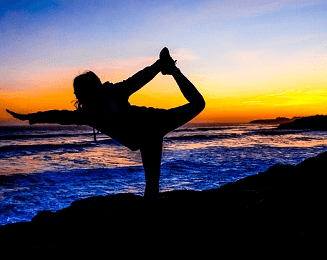 If you learn best by trying things for yourself, you can start by going to the practice section and come back to check any meanings that don't make sense. √ disposal, n.- “I’m at your disposal” means “I’m available for whatever you want.” A garbage disposal is a machine that grinds up garbage. √ exponent, n.- a mathematical term for a factor that multiplies a number by itself a certain number of times. For example, 5 to the 3rd power=5x5x5. Now see if you can use these words in sentences. Fill in the blanks with English words derived from ponere in the list above. Example: The Green Party organized a protest to ____________ the factory’s pollution. To study more Latin roots and the English words that come from them, see 50 Word Roots from Latin. See List of Suffixes for more on the word endings that change the part of speech and position of a word in a sentence. 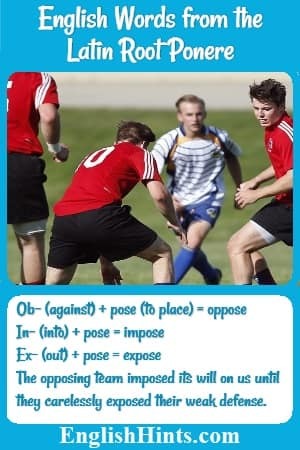 Home> Roots, Prefixes and Suffixes> English Words from the Latin Root Ponere. 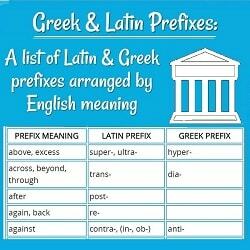 This is a useful list of the English meanings and then the Latin prefixes and Greek prefixes that mean the same thing.